It might bring some light to the forums and here are some of the top notch replies made in that thread. Bad Poll, no bacon option. --:--, you're doing polls wrong. Tacos > bacon in my book however I am sure we can compromise with a .....bacon taco? 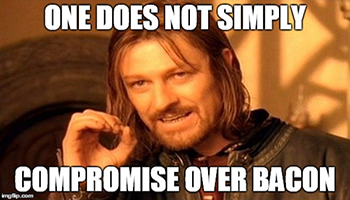 Also, one does not simply dismiss bacon as lesser than something else like you have done. Have you deliberately trolled us with that hyperlink Axel? Cause clicking on it leads you back to this thread, and copying the text into the browser address bar (or highlighting it and right-clicking to go to that address) sends you to No.. Beards thread about pictures that make your brain hurt, a thread where none of these responses originated. If anyone wants the actual link since I suspect Axel is messing with us over what thread he's referring to, its right here. I can say that it's too dangerous to reveal the thread in its original form. Links can be interesting if utilized correctly. A incorrect forum link can easily lead to unfamiliar territory like the message that this specific thread has landed in the famous bin hidden from the naked eye. Yeah, but that link doesn't lead to any unfamiliar place. We all remember No.. Beards "Images that makes your brain hurt" thread. As for messages, what are you talking about? Yeah, that's not what happens though. This thread opens just fine, and whilst neither URL up top doesn't open the thread you're referencing, either right clicking the link to go to No.. Beards thread or high-lighting and copying the link to lead a person (or animal or plant lol) here is also valid. That URL link is still functional even if it is a trick of sorts. If you were trying to break the link up top, it didn't work lol. I know there was 2 methods to use a link and the original idea was to troll with peoples who tried to find one of the most famous threads created by Sulaco. This would mean that a potential person who clicked the link would just get confused. Too bad I quickly spoiled the fun, wasn't it lol. I know that but there is still the likelihood that someone will click at random links without noticing anything. Should we take a second and remember the famous rulebook that you wrote nearly 2 years ago? Odds probably went down though after I posted my comment though. I think by posting about it you just did, lol. The rulebook is one of the posts which got buried down in the grave so it would be unknown but it's probably the main reason why it's remembered today. I do still have the screenshot stored on my PC with the famous rulebook. It's the original screenshot which got posted on the BV page about that post.